The arts and drama festival, which is kindly supported by NFU Mutual Insurance Society, is taking place in Ballymoney High School on Thursday, February 14th and Friday, February 15th 2019. The performances will begin on Thursday, February 14th at Ballymoney High School with plays from Finvoy YFC, Lisnamurrican YFC, Collone YFC and Glarryford YFC. 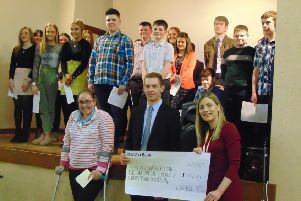 On Friday, February 15th, the second evening of performances will see Spa YFC, Kilrea YFC, Kilraughts YFC and Holestone YFC take to the stage. The Friday night show will also include the overall adjudication, with the top five YFCU clubs making it through to the prestigious art gala at the Millennium Forum, Londonderry on Saturday, March 16th.